A possible nuclear fission chain reaction. 1. A uranium-235 atom absorbs a neutron, and fissions into two new atoms (fission fragments), releasing three new neutrons and a large amount of binding energy. 2. One of those neutrons is absorbed by an atom of uranium-238, and does not continue the reaction. Another neutron leaves the system without being absorbed. However, one neutron does collide with an atom of uranium-235, which then fissions and releases two neutrons and more binding energy. 3. Both of those neutrons collide with uranium-235 atoms, each of which fissions and releases a few neutrons, which can then continue the reaction. A nuclear chain reaction occurs when one single nuclear reaction causes an average of one or more subsequent nuclear reactions, thus leading to the possibility of a self-propagating series of these reactions. The specific nuclear reaction may be the fission of heavy isotopes (e.g., 235U). The nuclear chain reaction releases several million times more energy per reaction than any chemical reaction. Chemical chain reactions were first proposed by German chemist Max Bodenstein in 1913, and were reasonably well understood before nuclear chain reactions were proposed. It was understood that chemical chain reactions were responsible for exponentially increasing rates in reactions, such as produced chemical explosions. The concept of a nuclear chain reaction was reportedly first hypothesized by Hungarian scientist Leó Szilárd on September 12, 1933. The neutron had been discovered in 1932, shortly before. Szilárd realized that if a nuclear reaction produced neutrons, which then caused further nuclear reactions, the process might be self-perpetuating. Szilárd, however, did not propose fission as the mechanism for his chain reaction, since the fission reaction was not yet discovered or even suspected. Instead, Szilárd proposed using mixtures of lighter known isotopes which produced neutrons in copious amounts. He filed a patent for his idea of a simple nuclear reactor the following year. In 1936, Szilárd attempted to create a chain reaction using beryllium and indium, but was unsuccessful. After nuclear fission was discovered and proved by Otto Hahn and Fritz Strassmann in December 1938, Szilárd and Enrico Fermi in 1939 searched for, and discovered, neutron multiplication in uranium, proving that a nuclear chain reaction by this mechanism was indeed possible. This discovery prompted the letter from Szilárd and signed by Albert Einstein to President Franklin D. Roosevelt warning of the possibility that Nazi Germany might be attempting to build an atomic bomb. On December 2, 1942, a team led by Enrico Fermi produced the first artificial self-sustaining nuclear chain reaction with the Chicago Pile-1 (CP-1) experimental reactor in a racquets court below the bleachers of Stagg Field at the University of Chicago. Fermi's experiments at the University of Chicago were part of Arthur H. Compton's Metallurgical Laboratory of the Manhattan Project; the lab was later renamed Argonne National Laboratory, and tasked with conducting research in harnessing fission for nuclear energy. In 1956, Paul Kuroda of the University of Arkansas postulated that a natural fission reactor may have once existed. Since nuclear chain reactions only require natural materials (such as water and uranium), it is possible to have these chain reactions occur where there is the right combination of materials within the Earth's crust. Kuroda's prediction was verified with the discovery of evidence of natural self-sustaining nuclear chain reactions in the past at Oklo in Gabon, Africa in September 1972. 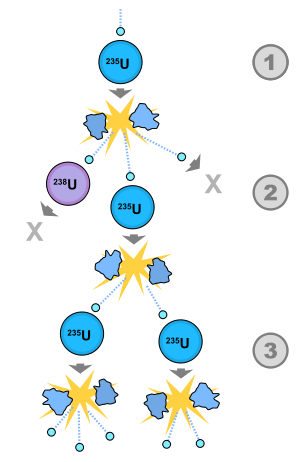 Fission chain reactions occur because of interactions between neutrons and fissile isotopes (such as 235U). The chain reaction requires both the release of neutrons from fissile isotopes undergoing nuclear fission and the subsequent absorption of some of these neutrons in fissile isotopes. When an atom undergoes nuclear fission, a few neutrons (the exact number depends on several factors) are ejected from the reaction. These free neutrons will then interact with the surrounding medium, and if more fissile fuel is present, some may be absorbed and cause more fissions. Thus, the cycle repeats to give a reaction that is self-sustaining. Nuclear power plants operate by precisely controlling the rate at which nuclear reactions occur, and that control is maintained through the use of several redundant layers of safety measures. Moreover, the materials in a nuclear reactor core and the uranium enrichment level make a nuclear explosion impossible, even if all safety measures failed. On the other hand, nuclear weapons are specifically engineered to produce a reaction that is so fast and intense it cannot be controlled after it has started. When properly designed, this uncontrolled reaction can lead to an explosive energy release. Nuclear weapons employ high quality, highly enriched fuel exceeding the critical size and geometry (critical mass) necessary in order to obtain an explosive chain reaction. The fuel for energy purposes, such as in a nuclear fission reactor, is very different, usually consisting of a low-enriched oxide material (e.g. UO2). Due to the extremely large value of the speed of light, c, a small decrease in mass is associated with a tremendous release of active energy (for example, the kinetic energy of the fission fragments). This energy (in the form of radiation and heat) carries the missing mass, when it leaves the reaction system (total mass, like total energy, is always conserved). While typical chemical reactions release energies on the order of a few eVs (e.g. the binding energy of the electron to hydrogen is 13.6 eV), nuclear fission reactions typically release energies on the order of hundreds of millions of eVs. Note that these equations are for fissions caused by slow-moving (thermal) neutrons. The average energy released and number of neutrons ejected is a function of the incident neutron speed. Also, note that these equations exclude energy from neutrinos since these subatomic particles are extremely non-reactive and, therefore, rarely deposit their energy in the system. The prompt neutron lifetime, l, is the average time between the emission of neutrons and either their absorption in the system or their escape from the system. The term lifetime is used because the emission of a neutron is often considered its "birth," and the subsequent absorption is considered its "death." For thermal (slow-neutron) fission reactors, the typical prompt neutron lifetime is on the order of 10−4 seconds, and for fast fission reactors, the prompt neutron lifetime is on the order of 10−7 seconds. These extremely short lifetimes mean that in 1 second, 10,000 to 10,000,000 neutron lifetimes can pass. The average (also referred to as the adjoint unweighted) prompt neutron lifetime takes into account all prompt neutrons regardless of their importance in the reactor core; the effective prompt neutron lifetime (referred to as the adjoint weighted over space, energy, and angle) refers to a neutron with average importance. In this formula, k is the effective neutron multiplication factor, described below. k < 1 (subcriticality): The system cannot sustain a chain reaction, and any beginning of a chain reaction dies out over time. For every fission that is induced in the system, an average total of 1/(1 − k) fissions occur. k = 1 (criticality): Every fission causes an average of one more fission, leading to a fission (and power) level that is constant. Nuclear power plants operate with k = 1 unless the power level is being increased or decreased. k > 1 (supercriticality): For every fission in the material, it is likely that there will be "k" fissions after the next mean generation time. The result is that the number of fission reactions increases exponentially, according to the equation , where t is the elapsed time. Nuclear weapons are designed to operate under this state. There are two subdivisions of supercriticality: prompt and delayed. When describing kinetics and dynamics of nuclear reactors, and also in the practice of reactor operation, the concept of reactivity is used, which characterizes the deflection of reactor from the critical state. ρ=(k-1)/k. InHour is a unit of reactivity of a nuclear reactor. In a nuclear reactor, k will actually oscillate from slightly less than 1 to slightly more than 1, due primarily to thermal effects (as more power is produced, the fuel rods warm and thus expand, lowering their capture ratio, and thus driving k lower). This leaves the average value of k at exactly 1. Delayed neutrons play an important role in the timing of these oscillations. In an infinite medium, the multiplication factor may be described by the four factor formula; in a non-infinite medium, the multiplication factor may be described by the six factor formula. Not all neutrons are emitted as a direct product of fission; some are instead due to the radioactive decay of some of the fission fragments. The neutrons that occur directly from fission are called "prompt neutrons," and the ones that are a result of radioactive decay of fission fragments are called "delayed neutrons." The fraction of neutrons that are delayed is called β, and this fraction is typically less than 1% of all the neutrons in the chain reaction. The delayed neutrons allow a nuclear reactor to respond several orders of magnitude more slowly than just prompt neutrons would alone. Without delayed neutrons, changes in reaction rates in nuclear reactors would occur at speeds that are too fast for humans to control. The region of supercriticality between k = 1 and k = 1/(1-β) is known as delayed supercriticality (or delayed criticality). It is in this region that all nuclear power reactors operate. The region of supercriticality for k > 1/(1-β) is known as prompt supercriticality (or prompt criticality), which is the region in which nuclear weapons operate. The change in k needed to go from critical to prompt critical is defined as a dollar. Nuclear fission weapons require a mass of fissile fuel that is prompt supercritical. For a given mass of fissile material the value of k can be increased by increasing the density. Since the probability per distance traveled for a neutron to collide with a nucleus is proportional to the material density, increasing the density of a fissile material can increase k. This concept is utilized in the implosion method for nuclear weapons. In these devices, the nuclear chain reaction begins after increasing the density of the fissile material with a conventional explosive. In the gun-type fission weapon two subcritical pieces of fuel are rapidly brought together. The value of k for a combination of two masses is always greater than that of its components. The magnitude of the difference depends on distance, as well as the physical orientation. Once the mass of fuel is prompt supercritical, the power increases exponentially. However, the exponential power increase cannot continue for long since k decreases when the amount of fission material that is left decreases (i.e. it is consumed by fissions). Also, the geometry and density are expected to change during detonation since the remaining fission material is torn apart from the explosion. Detonation of a nuclear weapon involves bringing fissile material into its optimal supercritical state very rapidly. During part of this process, the assembly is supercritical, but not yet in an optimal state for a chain reaction. Free neutrons, in particular from spontaneous fissions, can cause the device to undergo a preliminary chain reaction that destroys the fissile material before it is ready to produce a large explosion, which is known as predetonation. To keep the probability of predetonation low, the duration of the non-optimal assembly period is minimized and fissile and other materials are used which have low spontaneous fission rates. In fact, the combination of materials has to be such that it is unlikely that there is even a single spontaneous fission during the period of supercritical assembly. In particular, the gun method cannot be used with plutonium (see nuclear weapon design). Chain reactions naturally give rise to reaction rates that grow (or shrink) exponentially, whereas a nuclear power reactor needs to be able to hold the reaction rate reasonably constant. To maintain this control, the chain reaction criticality must have a slow enough time-scale to permit intervention by additional effects (e.g., mechanical control rods or thermal expansion). Consequently, all nuclear power reactors (even fast-neutron reactors) rely on delayed neutrons for their criticality. An operating nuclear power reactor fluctuates between being slightly subcritical and slightly delayed-supercritical, but must always remain below prompt-critical. It is impossible for a nuclear power plant to undergo a nuclear chain reaction that results in an explosion of power comparable with a nuclear weapon, but even low-powered explosions due to uncontrolled chain reactions, that would be considered "fizzles" in a bomb, may still cause considerable damage and meltdown in a reactor. For example, the Chernobyl disaster involved a runaway chain reaction but the result was a low-powered steam explosion from the relatively small release of heat, as compared with a bomb. However, the reactor complex was destroyed by the heat, as well as by ordinary burning of the graphite exposed to air. Such steam explosions would be typical of the very diffuse assembly of materials in a nuclear reactor, even under the worst conditions. In addition, other steps can be taken for safety. For example, power plants licensed in the United States require a negative void coefficient of reactivity (this means that if water is removed from the reactor core, the nuclear reaction will tend to shut down, not increase). This eliminates the possibility of the type of accident that occurred at Chernobyl (which was due to a positive void coefficient). However, nuclear reactors are still capable of causing smaller explosions even after complete shutdown, such as was the case of the Fukushima Daiichi nuclear disaster. In such cases, residual decay heat from the core may cause high temperatures if there is loss of coolant flow, even a day after the chain reaction has been shut down (see SCRAM). This may cause a chemical reaction between water and fuel that produces hydrogen gas which can explode after mixing with air, with severe contamination consequences, since fuel rod material may still be exposed to the atmosphere from this process. However, such explosions do not happen during a chain reaction, but rather as a result of energy from radioactive beta decay, after the fission chain reaction has been stopped. ↑ Jogalekar, Ashutosh. "Leo Szilrd, a traffic light and a slice of nuclear history". Scientific American. Retrieved 4 January 2016. ↑ Lise Meitner: Otto Hahn - the discoverer of nuclear fission. In: Forscher und Wissenschaftler im heutigen Europa. Stalling Verlag, Oldenburg/Hamburg 1955. ↑ Holl, Jack (1997). Argonne National Laboratory, 1946-96. University of Illinois Press. ISBN 0-252-02341-2. 1 2 3 4 5 6 Duderstadt, James; Hamilton, Louis (1976). Nuclear Reactor Analysis. John Wiley & Sons, Inc. ISBN 0-471-22363-8. 1 2 3 Lamarsh, John; Baratta, Anthony (2001). Introduction to Nuclear Engineering. Prentice Hall. ISBN 0-201-82498-1. ↑ Carey Sublette (February 20, 1999). "4.1.5.3 Predetonation". 4. Engineering and Design of Nuclear Weapons: 4.1 Elements of Fission Weapon Design. nuclearweaponarchive.org. Retrieved June 29, 2014.